The Sirius Accounts Payable application provides control of your payments by vendor and by job to keep you on top of your cash flow. Extensive monthly reports maintain the necessary detail and history to enhance management of your payables and satisfy audit requirements. On-line inquiry into paid and unpaid invoice give you complete control over your payables. 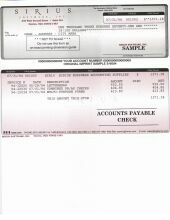 On-line selection of what to pay makes check writing easy. Vendors are maintained separately from suppliers in Purchase Order, but may be extracted from the Purchase Order module.